I came across an interesting article this morning about digital publishing. It includes the familiar discussion about the Internet eroding traditional sources of revenue for publishers and suggests that they should look to Meredith Corporation to figure out how to survive the evolution. Not sure who Meredith is? Neither was I. They’re an American publishing company most well-known for lifestyle magazines like Better Homes and Gardens, Family Circle, and the thrillingly-titled Wood. In recent years, they’ve been dubbed one of the most successful publishing companies in the United States. Earlier this year, Meredith was poised to take over the majority of Time Warner’s magazines, including Entertainment Weekly and People. Time decided not to enter into the venture, but the fact that they almost went through with it got me thinking. How was Little Meredith in the position to take over most of Time Warner’s magazines? How is Meredith so successful? It is actually quite simple. Meredith has developed two key profit-making strategies. Firstly, they have considered alternatives to advertising and circulation for revenue. For example, they license their magazine brands, like Better Homes and Gardens, to producers of household appliances and home decor. Secondly, they have discovered the power of repurposing their content across multiple platforms. They have acknowledged the value of digital content, not only as a component of their products, but also as an essential tool in the promotion of those products. Meredith has modified their content to suit a range of platforms, including magazines, books, tablets, websites and mobile devices. Material that was originally written for magazines is also used as the foundation for numerous other publications and magazine products. This has become an essential part of their business model. 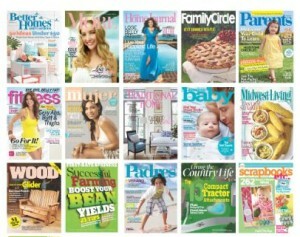 Meredith’s compilation editorial products, such as glossy ‘bookazines’ can live on newsstands for weeks and are very profitable. Because they don’t have an expiration date they continue to bring in money for the company long after publication. While this has certainly attributed to their steady profits and margins, it is not the key to their success. The repurposing of content is a clever strategy and publishers across the board can imitate Meredith’s business model. Tweaking content so that it suits a variety of different platforms is much easier and less time writing from scratch. It works just as well for digital publishers too. Better, in fact, since the digital newsstand never runs out of shelf space.